Neckarsulm on April 26, 1969: the first day of Audi NSU Auto Union, the company that would later develop into the AUDI AG we know today, was a momentous occasion. Following at times heated discussions at the extraordinary general meeting of NSU Motorenwerke AG held 40 years ago, the NSU stockholders finally approved a merger with the VW subsidiary Auto Union GmbH. The press dubbed the event the “stockholders meeting of the year” – after all, the birth of the new company was not without its share of controversy. On March 10, 1969, a merger agreement was signed between Auto Union GmbH and NSU Motorenwerke AG. 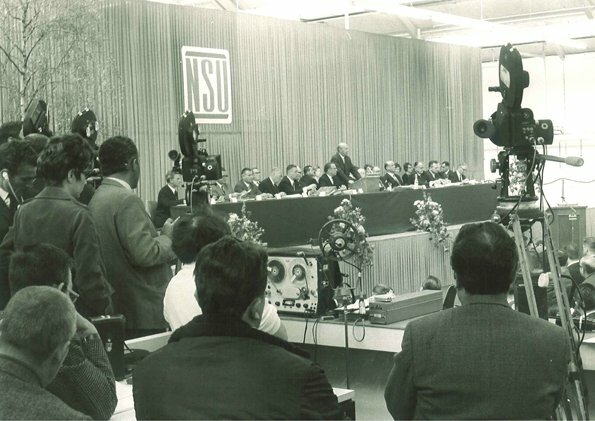 After exactly 12 hours and 21 minutes of sometimes heated discussion with initial resistance from the NSU stockholders, the agreement was approved at a special meeting of stockholders on April 26, 1969. On August 21, 1969 the agreement became effective with the merger backdated to January 1, 1969. The key argument that clinched the NSU stockholders’ approval was the conversion of income from the so-called “Wankel licenses” into NSU participation certificates, which remained in the hands of the NSU stockholders after the merger. VW then transferred its shares in its Auto Union subsidiary to NSU. The new firm was named Audi NSU Auto Union AG. Neckarsulm became the company’s corporate seat and Dr. Gerd Stieler von Heydekampf, chief executive of NSU at the time, was appointed as chairman of the board of management.